If you are your own worst critic raise your hand! I am FOR SURE the hardest on myself. But in turn, that makes my expectations of others pretty high too. How we view ourselves is how we view the world. 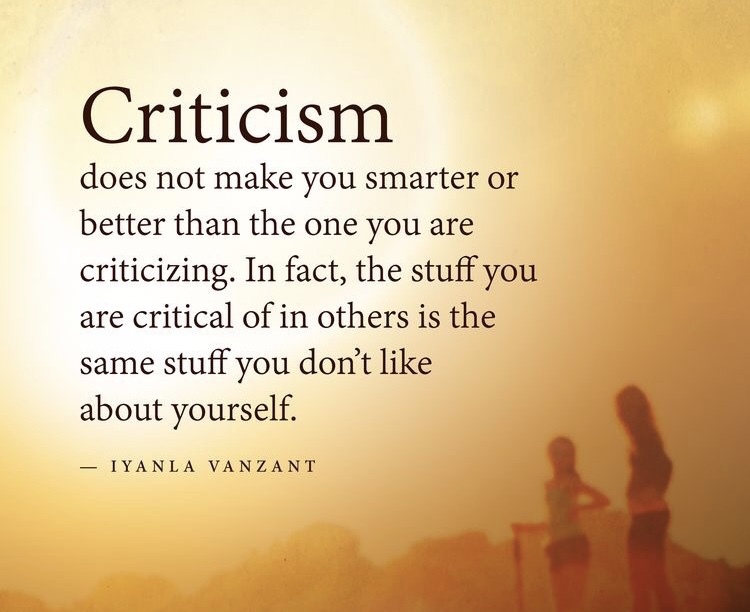 So our response to criticism is a direct reflection of that. Constructive Criticism - comes from a place of love. Encourages self-reflection and improvement. Objective and well thought out. Presented in an encouraging manner. Projected Criticism - comes from a place of fear. Often a direct projection of one's negative feelings brought on by an emotional trigger or insecurity. Presented in a disapproving manner that often causes emotional pain to both parties involved. The other day, I had someone close to me dish out a fat dose of projected criticism. I was immediately on the defense. The person's response was "You just can't take criticism". WOAH there friend!! I absolutely CAN take it when delivered properly and in a constructive manner. I'm always willing to look at myself and make improvements. But it got me thinking about how to handle it when it wasn't delivered in a neat little Shannan-friendly package. This is a challenge for me. I imagine it is for most people. I reflected (or obsessed) on this for an entire day. And in the interim, I was cranky and discontent because I felt bad about myself that entire 24 hours. This person's projected criticism had brought out my inner critic in full force! It was up to me to squelch this situation. I did some writing and realized that the feeling that stuck out the most was inadequacy. A core belief that I've been working on for years. Not being enough. That little fella had been buried for a while and came rushing back to the surface. Just recognizing that feeling of inadequacy helped me feel better. It helped me release the anger at the person who brought it out in the first place. It helped me realize that I'm a work in progress and not everything will roll off of me like water off a duck's back. That is unrealistic. I'm a human being with real emotions and they will sometimes spill out and that's OK. The key for me is recognizing where inner work needs to be done and taking the steps to do it. I make a point to ALWAYS offer criticism in a constructive way. To my clients, to my family, to my friends and to my kids. And you know what else?? Sometimes it's ok to keep your yap shut! Even if offered in a kind way, there are people who don't need to hear it. Be mindful of the emotional state of the person you're dealing with. Not everyone has self-awareness or wants to hear your opinion.